Fifty five years after The Beatles' introduction collection Please Me turned out, hordes of individuals are as yet emitting into shouts at seeing Paul McCartney. 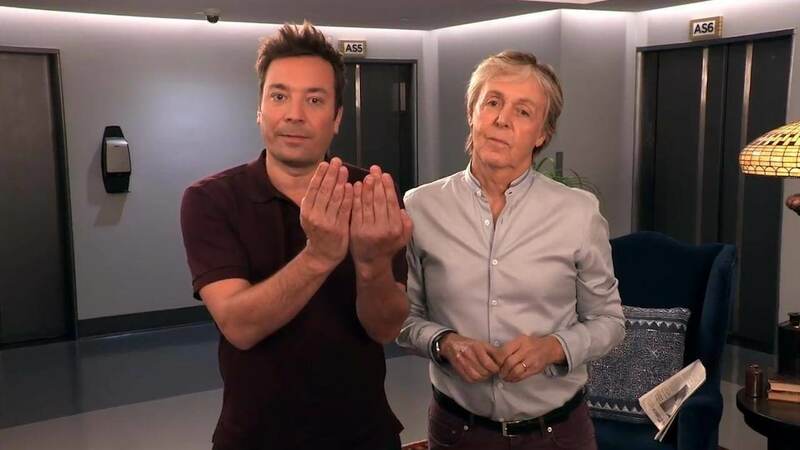 In a video cut publicized in front of McCartney's appearance on The Tonight Show with Jimmy Fallon on Thursday, the match were seen astonishing visitors who were on a voyage through US TV arrange NBC's studios at the Rockefeller Center in New York. The lift entryways "coincidentally" open on the wrong floor, offering those on the visit a short lived look at first Fallon, and after that McCartney taking part in different tricks. Those in the lift respond with shouts - obviously of enjoyment - at seeing Fallon, and achieve an euphoric crescendo each time McCartney is then uncovered. One visitor is seen starting to wander out of the lift towards the combine, however the lift administrator holds her back. "One of them attempted to get out," McCartney tells Fallon, after the combine had uncovered their personalities from behind duplicates of The New York Times while sitting on wingback seats. Another man in the lift yells: "No chance!" when McCartney is uncovered. "Goodness better believe it way!" the vocalist reacts. In a last clasp, the combine sing The Beatles' hit "Drive My Car" from 1965 collection Rubber Soul, just this time when the lift entryways open, there are no visitors there.